This week’s KnitBits, due out on Friday, is the second in a series of themed entries called the Recession Collection. Last week’s issue was a collection of 50 projects you can knit for under 50 dollars–a LOT less than 50 dollars in most cases. Not a subscriber? KnitBits is a weekly newsletter that brings you free patterns and stories about the wide world of knitting. Browse our archives and if you like what you see, subscribe! The theme of this week’s issue is staycations–the sort of holiday you take when you can’t afford to jump on a plane headed for luxurious locales. Our feeling is that knitters know how to make the best out of a weekend on a couch. You can read our “travelogues” below but you’ll have to look for KnitBits #267 to see what Norah and Margery whipped up over the weekend. N: Much Ado about Nothing with Kenneth Brannagh. I laughed, I cried, ……I sang! M: Off the top of my head, month by month: Bell Book & Candle in December, Giant in January, All About Eve in February, Rebel Without a Cause in March, Vertigo in April, Splendor in the Grass in May, Rear Window in June, Dirty Dancing in July, A Walk on the Moon in August, Breakfast at Tiffany’s in September, The Body Snatchers in October, La Strada in November. N: Hot cocoa with a star anise pod thrown in. M: Just a nice glass of Chianti. N: Chocolate and honey toasted on good bread. M: Tarmasalata (Greek caviar spread) on a tuscan cracker. C: Grilled cheese made with Cotswold cheddar–a double Gloucester cheese with chives. Who or what surrounds you on the couch? N: Lena and Jake, some tapestry needles (fallen behind the cushions) and big comfy pillows. M: Memories of my dear cat Fred. How do you unwind and shut out the world at the end of the work week? N: I like to plant myself on the couch and watch long marathons of TV – like the Gilmore Girls or Project Runway. M: We take Max, Olivia and Noah [Ed: Margery’s son, daughter-in-law and beloved grandson] to our favorite Indian restaurant and we have a Bombay Sapphire Martini while Noah drinks a mango lassi and we all munch on pappadam. MMMMM! What does the knitting glitterati do behind close doors when they’re knitting for themselves and themselves alone? N: When I’m really fried – garter stitch. M: My new love is my sewing machine, so that is were I go to update my wardrobe. When it is yarn I am craving in my hands, I crochet and felt, hats, bags and other vessels. 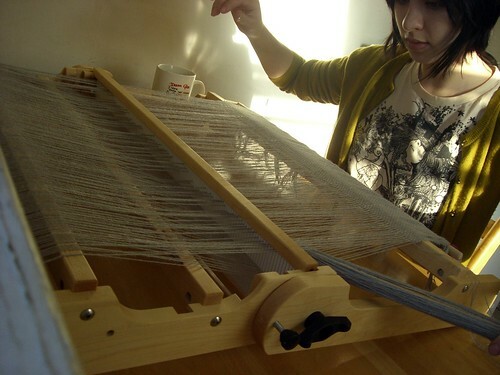 C: Like Margery, I’ve been ‘cheating’ on my needles…I spin or weave! It’s a good way to get a little instant fiber gratification without having to think about shaping or fit or gauge…as long as I’m touching yarn, I’m happy! And like Norah, I always love garter stitch. I hope you’ll join us–answer any of the questions you like, either in the comments or at your blog. hmmm, weaving. now that could be the next obsession. Seriously tempting! Unfortunately, I like all of your answers, so i’m not sure which is the best match. Peep Show is my absolute favorite thing right now! Right now I’m cheating on my knitting with inkle weaving–doesn’t take up much space and you can do some fun, quick projects with it. Loved all the answers, but M’s movie choices rocked! Gonna put on Rear Window and finish a felting project, surrounded by my dog and two cats, of course. What fun to know more about my favorite design team! Margery, my condolences on the loss of Fred. My favorite Please Myself knitting is a saddle-shoulder sweater knitted in the round out of my own handspun. NOTHING comforts like yarn I knew as a fleece, yet there are “pay attention” points along the way, enough to wake me up now and then, with plenty of plain ’round and ’round knitting in the middle. When the going gets tough, I park myself on the couch with several wonderful cats, a handspun sweater OR a lace project, and Ramsey’s Kitchen Nightmares on the tube (drama and lots of beautiful food on BBCAmerica). Another great favorite movie is Local Hero. I defy anyone to watch that movie and hear that music, and NOT cast on for a Fair Isle, or some other form of color-patterned knitting, although Kilt Hose can work, too. None of those things, except for my wonderful cats, would be anywhere near as much fun if I didn’t have my knitting and spinning to go along with them. A happy and safe Thanksgiving to all. The blog I list there has become more fibery than ink and scrappy, lol! Neglected of late, tho. Anyway!! When I DON’T want to think, which I must do in COPIOUS amounts for the afore-mentioned project because I’m a fairly new knitter (sarebear on Ravelry) . . . .
Fave escapist movie – Besides disaster movies, I really escape into Sense and Sensibility, my all time fave – the language, the everything!!! A guilty pleasure snack or comfort food recipe: Hrm . . .. Dreyer’s Butterfinger Ice Cream, or Farr’s Peppermint Ice Cream, or Farr’s Peanut Butter Lover’s (I think) Ice Cream . . . or Dairy Queen’s Chocolate Covered Strawberry Blizzard, mmmm. And here I am, lactose intolerant . . . . . thank goodness for Lactaid, whee!!! Who or what surrounds you on the couch . . . . . laundry!!! a bag with my current project in it, my beading stuff that I may not have touched in awhile but I’m definitely getting back to, my first spinning that I can’t finish until I get s’more dyed up so I can ply it along the whole length of the first 4 ounces so any differences will well be in the 2nd ply on the whole length, not changing mid-length in the skein. Didn’t know enough to order 8 oz to start, if I wanted to make a scarf, when I first started. Want that first spinning started to be plied, I want to learn that, and start knitting it!!! You can see the spinning in my ravelry projects. Oh, and TONS more laundry. Thanks for the great post, if you have read this far, congrats . . . . when my project is done it’ll be more hand-towel size (the project that requires thinking, lol, and the reason the gryffon is because our guild name has a gryffon in it!) Also the chain is done on a reverse-stockinette background and the gryffon on a stockinette, so designing a nice transition (working with ideas in the Mon Tricot book that I like and adapting, still takes alotto thinking and notes! kudos to you designers, I’m a determined newb tho) is also part of it. I Love geek+knit! Anyway, thanks for all the knitting goodness! I think I’ll go check out Much Ado About Nothing, I’m in a Kenneth Branaugh kind of mood . . ..
ckns poked into a Lopi afghan, dpns, knitting books, balls of yarn, hard ruler, tissues, something to drink, scissors, tapestry ndls, WIPs – there’s hardly room for me! All of your ideas make me wish for an empty house with the exception of my dogs, yarns, needles & the radio. So for me this winter I will be finally able to finish up me knitting/sitting/computer room. I just finished painting it. Tried my hand at sponging. It turned out really neat looking. No to get all of my yarn stash in there & something to sit in, comfy of course. This room is a 12X12 room & it was my daughter’s room. So now that my last baby is out of the house, it is just my husband, my dogs & 1 cat & me. I will have to get some pictures of it once it is completed. Take care all & stay warm & cozy…..
Buy some dumplings, watch some House, and have a knitting marathon! All wool, lots of stockinette. We miss the mini videos, Norah & Margery used to do. My mother has been knitting since she was three, in Europe. Her and I used to watch both of your segments, which inspired us to knit even more. BRING THEM BACK PLEASE!!! We miss them, and the music was good too. I am curious about Cirilia’s Matzoh Ball Soup. I consider myself a maven in that area. Cirilia, do you use chicken fat? Do you boil the M.B.s in the soup or in a separate pot of water? What surrounds me as I knit? All four cats (the kitten gets swatted because she thinks ALL yarn belongs to her) small projects (mittens & scarves & hats oh my!) for Christmas presents, a self-designed gansey for my 18-month old grandson (in a size 4 to grow into!) and dreams about other projects from all the new knitting books I just got (since knitters must start early, so do their presents!) I also have a loom but haven’t used it for a couple of years…no more table to load it on! Seen your site via msn the other day and absolutely like it so much. Keep up the fantastic work.